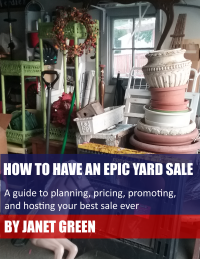 Living in a small house (625 square feet on the main floor) can be a challenge for a gal like me who loves to collect vintage and antique everything. Therefore, I am constantly looking for ways to make the most of the available space. 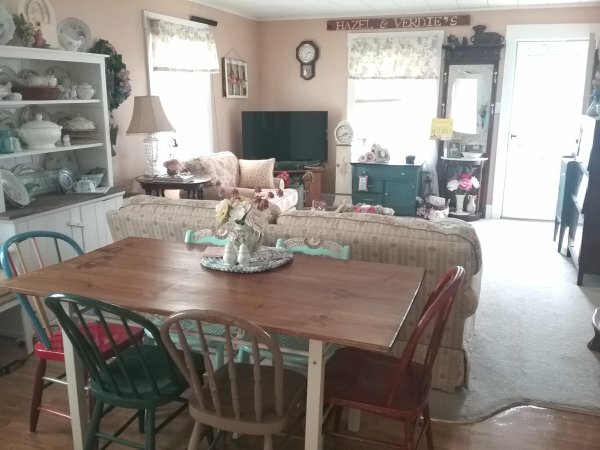 The fact that my rental house has an open floorplan is a big plus: when you walk in, the combined kitchen/dining/living room doesn’t feel as small as it really is (312 square feet). 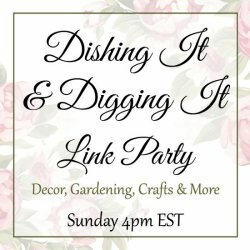 In today’s post I really only set out to share my dining room table… I love setting it with pretty dishes, but I also really like the way it looks on a typical day. 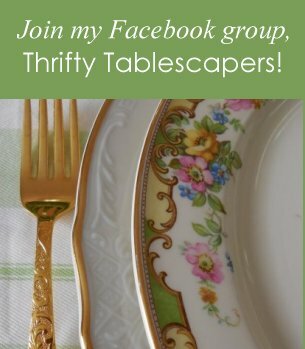 I also enjoy my collection of dining chairs – more on all of this in a moment! As I was taking pictures, it occurred to me that the placement of the table has helped to create two distinct spaces out of one larger one while still keeping that feeling of openness. So I want to talk about that too in case it’s helpful for others! With the dinner table placed directly behind the couch, it defines the dining space within the eat-in kitchen without blocking the view into the living room. And placing it here allows me to have a much bigger table than I could have if I had opted for a drop-leaf style over by the window. 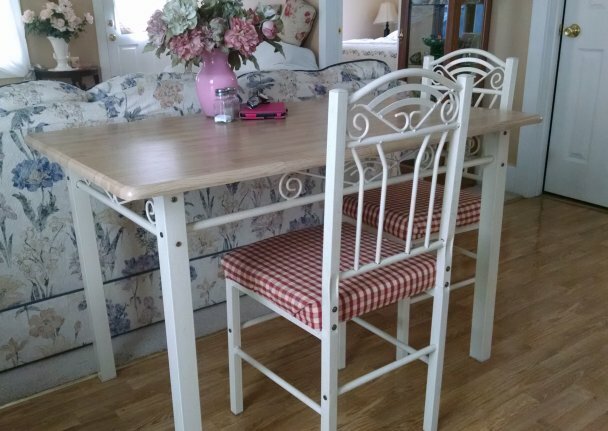 Now back to the actual table and chairs… they have evolved over the few years I’ve lived here! We started out like this, having found the whole set for free just prior to moving. This photo was taken right after I recovered a couple of the chairs. 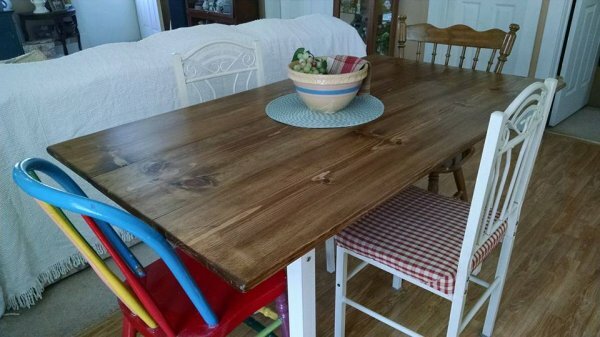 The table sat four, but the top was only 30 inches by 40 inches – barely room for TWO people to eat, let alone four! So when I asked Greg to make me a harvest-style top for the existing base, he made it much bigger: 36 x 60 inches. It now seats six people. 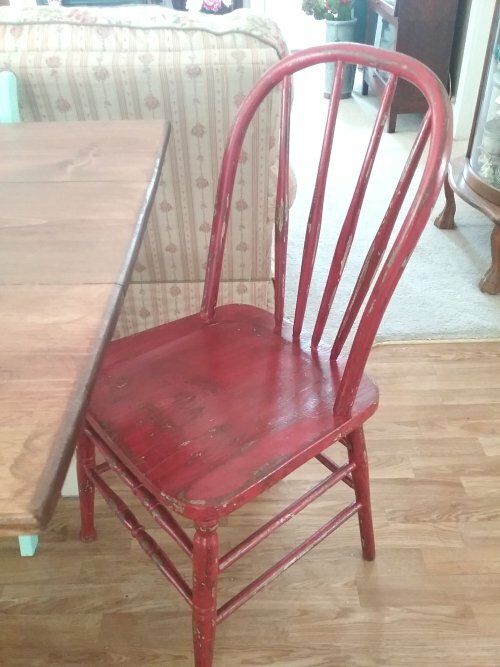 My “inspiration chair” is this one from my great-aunt Hazel’s home – she painted it in this crazy color scheme decades ago, and I don’t have the heart to repaint it! I love its shape and style, and so I keep an eye out for these everywhere. I have found three others that I use inside, and two others that I have outside in the garden. The red one is the newest acquisition – both it and the green one are curb picks. 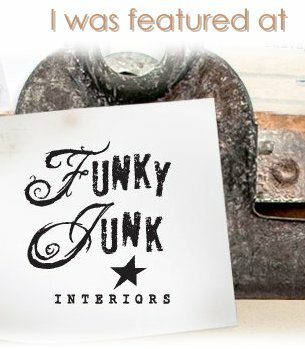 The taupe one was a flea market find. 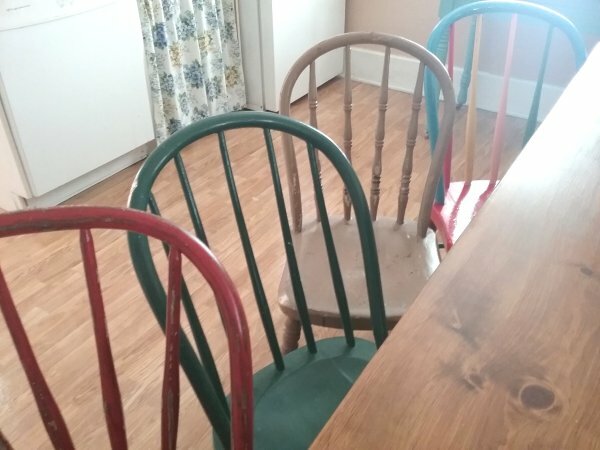 I don’t know if this exact style has a name – it may be a variation of the Windsor style – but I just call them Hazel chairs! 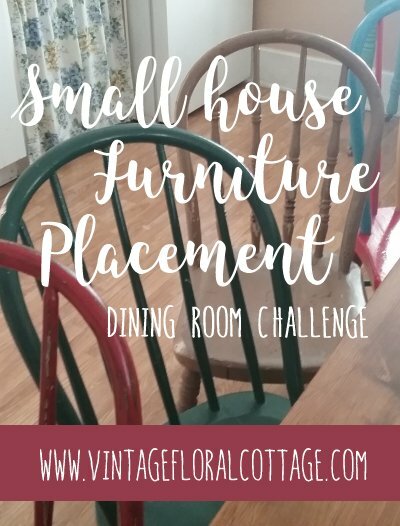 I think they have a lot of cottage charm, especially in their different colors, and their smaller scale makes them perfect for a small house. The other two chairs are a different style altogether with cane seats and pretty detailing across the backs. 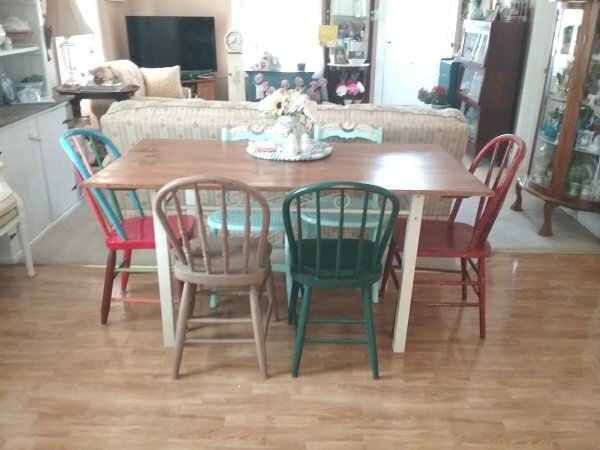 I found these on Facebook Marketplace and repainted them, plus painted and aged the detailing. 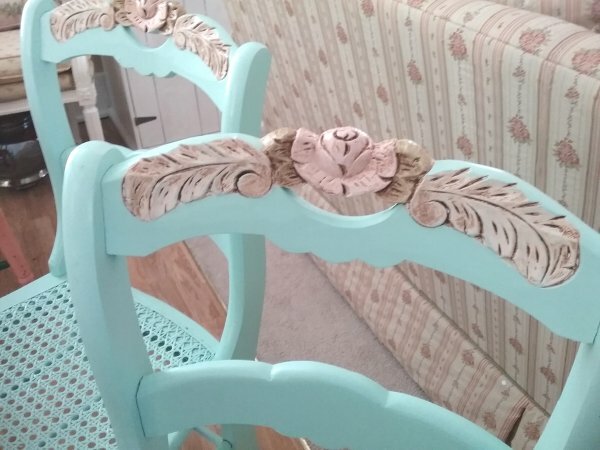 I call these my storybook chairs because the detailing now looks like an illustration you might find in a fairytale book. Overall I like the way the specific furniture pieces have evolved, and I think their placement contributes to (rather than hinders) the open feel of the room. What are your thoughts? 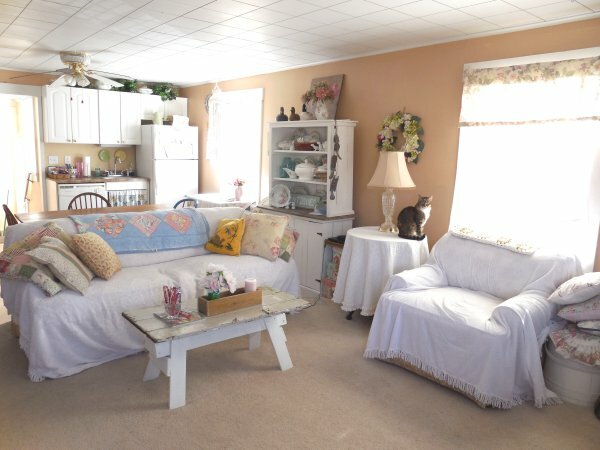 What’s your biggest furniture placement issue at home? If you are also living in a small house, how do you make the most of the available space? Pin this post for future inspiration! 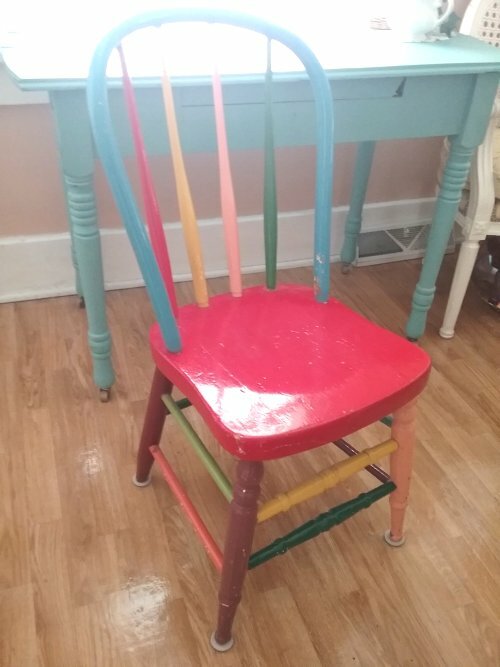 I love the colorful chairs! Although our space isn’t quite that small, we have a very small house. And we’ve been here 26 years, so we have accumulated a lot of stuff! Probably our most effective change was similar to yours. All we had for years was a tiny little kitchen nook for eating. 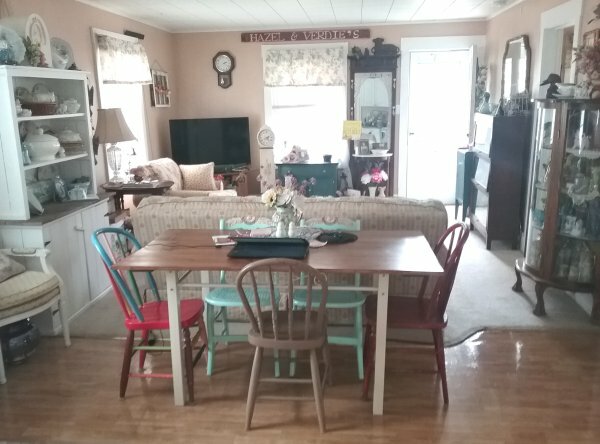 We finally made our living area a little smaller and made one end of the living room into our dining area. Huge difference!